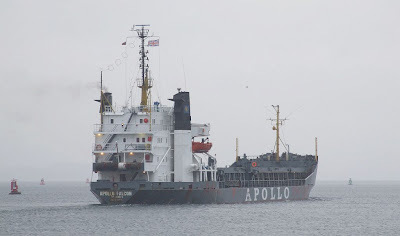 Fully laden with a cargo of cement, APOLLO FALCON steams slowly past Greenock today on a damp afternoon. In common with her sisters APOLLO HAWK and APOLLO EAGLE, which have both been on the river recently, this ship was built in 1972 under a different name. She was launched by the Arnhemsche Scheepsbouw yard in Holland as SUSAN MILLER, becoming ARTEMIS in 1978, ARTEMIS I in 1982 and finally taking her present name in 1999. Lengthened from 95.0 metres, like her sisters, by a Spanish shipyard in 1991 she now has an overall length of 101.38 metres. She has a deadweight of 6,336 tonnes and is some 4,255 gross tons. She is operated by a German company, L&L Shipping GmbH, and is registered in at St John's Antigua and Barbuda. LOl @ damp, thanfully it is brighter down here today, may get out for scan about this afternoon. Excellent pics as usual, thanks for sharing.